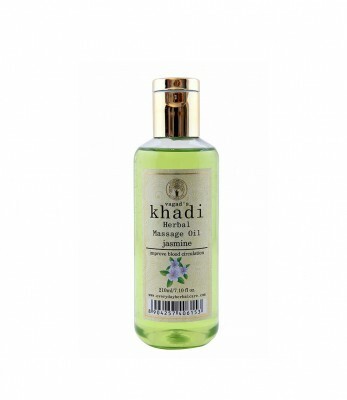 Vagad`s Khadi Jasmin massage Oil hormonizes the mind,body and soul.the relaxing qualities of jasmine reduces stress, improve blood circulation. The aromatic effect of jasmine oil stimulates the release of certain hormones in the body, including serotonin, which results in the boost of energy and the uplifted mood. Daily use of massage oil helps in keeping skin young and improves immunity. It deep penetrate into the skin and improves blood circulation.